Since the DRAMA release date is quickly approaching, I'd like to give everyone a chance to get in on the fun--not just buying the book, but making it into a celebration. So: I'm announcing a CONTEST! 1. Take a photo of yourself (or you and your friends) buying a copy of DRAMA on or near the release date. If you want to dress up as the main character, Callie, or any of the other characters...even better. 2. Post it somewhere! Your blog, Facebook, Twitter, Tumblr...anywhere! 3. "Like" my Facebook page, Raina Telgemeier's Comics. 4. Post a link to your photo/blog post/tweet/tumbl/etc on my Facebook page. Be sure to include the word #DRAMADAY (including the # symbol) in the post! That's it! You have until Saturday, September 8 at midnight EST to enter. 1. Original art of the DRAMA characters, by me! 2. A chance to "meet" me over Skype! You and I will both appear as guests on a future episode of the Comics Are Great live broadcast, and we can talk about whatever you like on the air! 3. A SMILE t-shirt in your choice of sizes. --Write a review on Goodreads, Amazon, Shelfari, B&N, or any other site that lets you review books! --Draw some fan art! There's nothing an artist loves more than seeing her characters interpreted by others. 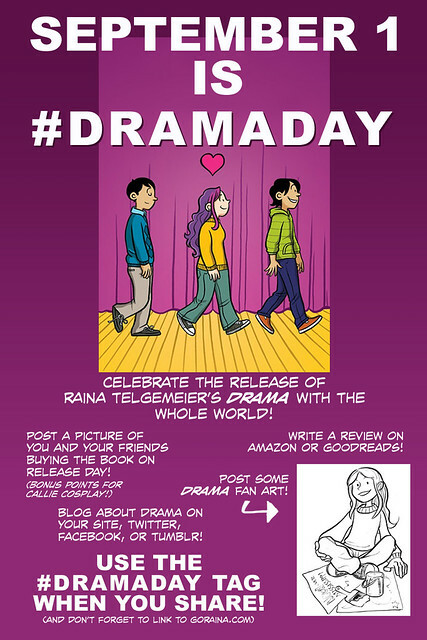 Here are a couple of web banners you can post on your site, to help spread the word about #DRAMADAY! Thanks to my friend Jerzy, who not only made the banners you see here, but suggested the idea of #DRAMADAY in the first place!